Entering the nursing field might not be a bad idea. The average growth rate for all jobs is 7%, according to the Bureau of Labor Statistics. But growth for nursing jobs is expected to be a lot faster than average. In the future the country will need more healthcare professionals to help treat aging Americans and the increasing number of people dealing with serious issues like hypertension and obesity. This is SmartAsset’s second annual study of the best places to be a nurse. Read the 2015 study here. 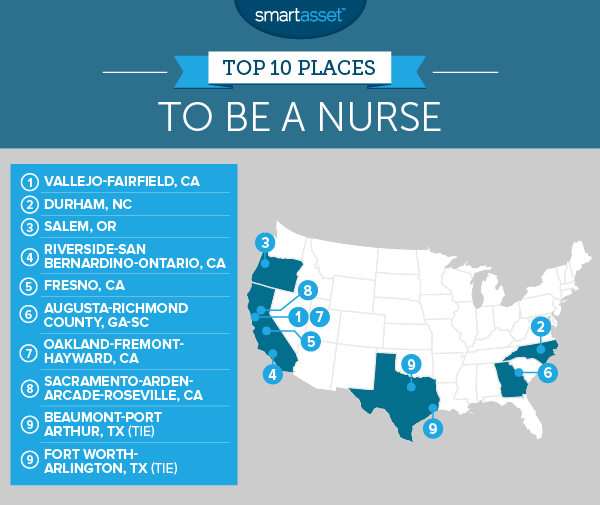 SmartAsset wanted to find the best places in the country for nurses. We pulled data for 149 of the largest metro areas and ranked them across four different metrics. We looked at five-year employment growth, five-year income growth, the average amount of discretionary income for nurses and the percentage of each metro area’s workforce in nursing. In our study, we focused on nurses in three different categories used by the Bureau of Labor Statistics (BLS): registered nurses, nurse practitioners and licensed practical and vocational nurses. Read more about our methodology below. California love. Five of the best places to be a nurse are metro areas in the Golden State. Job prospects for nurses look good. Whether they’re more comfortable on the east coast or the west coast, nurses are in demand. All of the top-ranking places on our list saw job growth for nurses rise by more than 10% over a five-year period. The best place to be a nurse is in northern California. Between 2010 and 2015, the number of nursing jobs in the Vallejo-Fairfield metro area increased by 25.9%. Meanwhile, the average income for nurses rose by 33.7%. 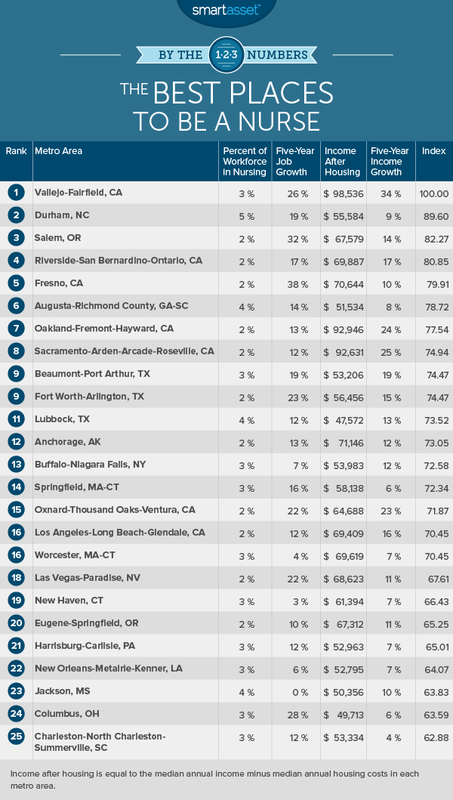 Some of the highest-paid nurses in the country live in the Vallejo-Fairfield metro area. On average, registered nurses and nurse practitioners make $128,480 and $156,340 per year, respectively. Nurses in Durham make up a larger share of the area’s workforce than those in any other metro area in our study. In 2015, there were more than 14,000 jobs for professional nurses in Durham. The average nurse in Durham ends up with $55,584 after paying for housing costs like property taxes and homeowners insurance. But the area’s cost of living isn’t that high. Residents spend $976 per month on housing-related expenses, on average. The Salem metropolitan area ranks third in terms of five-year job growth for nurses. Since 2010, the number of job opportunities for RNs, nurse practitioners and licensed practical and vocational nurses has increased by 32.4%. Nursing jobs now make up 2.5% of the jobs in the city of Salem and the communities around it. The economy in the Inland Empire is expanding fairly rapidly, thanks in part to growth in the logistics industry. The job outlook for nurses looks pretty good as well. The number of nursing jobs rose by 17.3% within a five-year period. Compared to the average worker in the region, nurse practitioners and registered nurses earn more than twice as much money annually. The number of nursing jobs in the Fresno metro area grew by 38.1% in the past five years. Between 2014 and 2015, the area added nearly 1,000 new jobs for nurses, according to the BLS. There are around 30 different medical centers in the Fresno metro area. Some of the region’s top employers for healthcare professionals include the Community Regional Medical Center, Saint Agnes Medical Center and the U.S. Veterans Hospital. According to the Georgia Department of Community Health, most of the counties in the state of Georgia can be classified as medically under-served. The Augusta metro area, which stretches across Georgia and South Carolina, is an example of one place where there aren’t enough health providers to care for the entire region’s population. Nurses who want to work in the area shouldn’t have a hard time finding jobs. Employers in the region created more than 400 opportunities for nurses between 2014 and 2015. Nurses devote their lives to caring for other people. And while money might not have motivated them to enter the profession, it can certainly be a major concern for many nurses who don’t want to struggle to make ends meet. The Oakland-Fremont-Hayward metro area is an expensive place to live, particularly for people who prefer renting over buying. But in the past five years, the average income for nurses in the region grew by 24.4%. Students who aspire to become nurses might want to consider attending college in California. According to the U.S. News & World Report, several universities in the state have top-ranking nursing programs, including the University of California, Los Angeles, the University of California, San Francisco and the University of San Diego. The average nurse who moves to California and settles into the Sacramento metro area can look forward to having around $92,631 to spend on discretionary items (after paying for housing costs). Texas has some of the highest property tax rates in the country. But housing costs in the Beaumont-Port Arthur metro area are much cheaper than they are in most places. Residents in the region spend just $653 on housing expenses each month, on average. That means that the average nurse who lives in the area has $53,206 left over to save and spend on other things. According to the U.S. Census Bureau, roughly 145,000 additional residents were added to the Dallas-Fort Worth-Arlington metro area between July 2014 and July 2015. As more people move into the region, the need for medical care will likely go up. BLS data shows that since 2010, nurses in the Fort Worth-Arlington area have seen a double-digit increase in the number of jobs available to them. New hospitals have also been built, including the Texas Rehabilitation Hospital of Arlington, which opened in 2015. To complete our analysis, we looked at 149 metro areas with a population of at least 300,000. We used several different metrics, including five-year job growth, five-year income growth and nursing jobs as a percentage of the total workforce in each metro area. We also considered the average income that nurses in each metro would have after paying for housing costs (by subtracting the median annual housing costs from the median annual income). Note that unlike our 2015 analysis, this year’s study excludes nurse anesthetists because so few metros were large enough to have any data for that category. After we ranked each metro area according to all four of our factors, we averaged those rankings. Then, we gave each metro area a score between 0 and 100. The top-ranking metro received a 100. Most of the data in our study comes from the Bureau of Labor Statistics. Our housing cost data, however, comes from the U.S. Census Bureau. The BLS recently redefined their metro areas. As a result, we removed 39 of the metro areas in our 2015 analysis from this year’s study. We also left two of the factors from our 2015 study out of this year’s analysis: one-year income growth for nurses and one-year job growth.